Ahjisi, a Khajiit bandit, is one of the hunters who shows up in Bloated Man's Grotto hunting Sinding. She is part of a tougher group that will only be normally encountered if you choose to help Sinding. They spawn on the path you already traveled from the entrance after speaking with Sinding. If you choose to hunt, then Sinding goes forward into the weaker group with Rissing, but if you choose to help him this tougher group will charge forward and attack. Ahjisi wears a set of hide armor with a matching pair of boots. 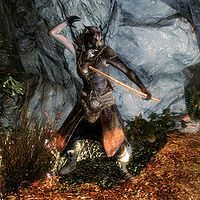 In combat, she relies on two steel daggers and a long bow with ten iron arrows. She also carries two leveled damage health poisons. This page was last modified on 27 March 2014, at 23:49.